As a result of broad-based immigration patterns in recent decades, humanity is moving toward a global society with interaction among peoples in every conceivable way – economic, political, social, ethnic, cultural, technological, religious. Our shrinking “global village” is evolving into a multi-racial, multi-cultural and multi-religious society. Indeed, we are witnessing the emergence of a global consciousness – an increasing number of people are coming to see themselves as members of one family in an interdependent universe. Across the planet, thousands of people including educators, humanitarians, social justice activists and religious people are working to develop A Global Ethic. This international effort to develop a set of universal moral principles calls upon the wisdom of the world’s many cultures, religions and secular philosophies. The purpose here is to develop a universal ethic that will address major problems including racism, militarism, sexism, widespread poverty, violence, ecological destruction as well as intercultural and interreligious strife. The Global Ethic is an expression of the emerging global consciousness. Accordingly, every human being in our global village is called to become a “global citizen” with both rights and responsibilities. “No human life without a world ethic for the nations. The challenge to implement a global ethic is complicated by the disparity and diversity in our world. What would the world look like if we were a village of 100 people? To find out, check this link from the Family Care Foundation. The Golden Rule, known also as the Ethic of Reciprocity, is considered to be a key reference point for the development of a Global Ethic. The Golden Rule is arguably the most consistent and most prevalent ethical teaching in history. Many regard it as the most concise and general principle of ethics. It is found in numerous cultures, religions, ethical systems, secular philosophies, indigenous (Native) traditions, and even in the mathematical sciences (e.g. the golden mean). And because the Golden Rule crosses so many traditions and philosophies, it possesses tremendous moral authority and reveals a profound unity underlying the diversity of human experience. The Golden Rule also emphasizes values of mutuality, interdependence and reciprocity. Given its omnipresence across history, the Golden Rule could be described as a universal ethical principle. To reflect on the Golden Rule is to reflect from the perspective of a universal wisdom. 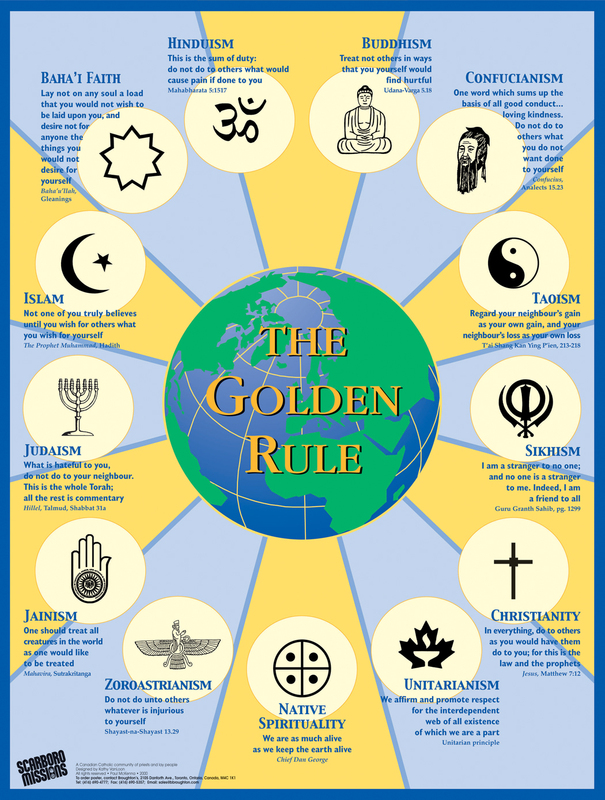 Accordingly, the Golden Rule is not just a moral ideal for relationships between people but also for relationships among nations, cultures, races, sexes, economies and religions. Clearly, the Golden Rule has the capacity to be the ethical cornerstone in developing a Global Ethic as the human family works together to build a peaceful, just and sustainable global society. The Golden Rule, with roots in a wide range of the world’s cultures, is well suited to be a global standard to which different cultures could appeal in resolving conflicts. As the world becomes more and more a single interacting global community, the need for such a common standard is becoming more urgent. In the nineteenth century, an American President – Willard Fillmore (1800-1874) – made a statement that captures rather well this marriage of the Golden Rule and the Global Ethic: “We should act toward other nations as we wish them to act toward us”. 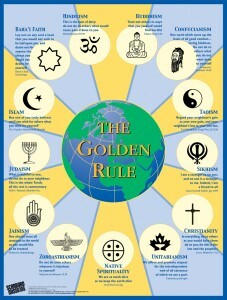 To read statements of the Golden Rule in thirteen religions (and in six languages), click here. We encourage the reproduction and use of this document for educational purposes.